RALEIGH — The North Carolina Department of Transportation, the Village of Pinehurst, the Town of Southern Pines and Moore County will join together to hold an informal public meeting on Thursday, July 9 about the Midland Road (N.C. 2) corridor study. The meeting will take place from 4 p.m. to 7 p.m. Thursday, July 9 in the Pinecrest High School Cafeteria at 250 Voit Gilmore Lane in Southern Pines. Midland Road is a four-lane highway between Clark Street in Southern Pines and the traffic circle in Pinehurst. It has two lanes in each direction separated by pine trees and other vegetation, and is considered a key link for the communities it connects, as well as for the numerous golf courses in the area. 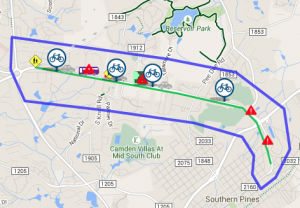 The purpose of this study is to address transportation and safety concerns and evaluate alternatives for a three-mile corridor from Airport Road in Pinehurst to Clark Street in Southern Pines. The meeting will gather public input and give citizens a chance to be involved in the planning process. The interactive event will include maps, exhibits and a variety of activities designed to help shape the future of the Midland Road (N.C. 2) corridor. Project representatives will be available to provide information, answer questions and receive comments. Citizens are welcome to attend at any time during the meeting hours, as there will not be a formal presentation. Additionally, citizens will be given an opportunity to provide written comments at the meeting or submit comments later. Public comments will also be accepted through August 6. Project information and an online survey are available by clicking here. For additional information, contact NCDOT Project Manager Chuck Dumas at 902 North Sandhills Boulevard, Aberdeen, 28315, 910-944-2344 or cdumas@ncdot.gov.